Yes, that's right, this pattern has 3 sizes of quilts. Throw - 64" x 80". Queen - 80" x 96". King - 96" x 112". 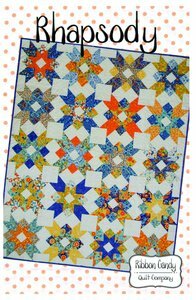 This pattern is fat quarter friendly and easy to make. Just choose the size you want and off you go. Before you know it you'll be done and ready for the next project. Easy to read instructions with lots of diagrams.